Buying Easter gifts can get costly if you have several people to buy for. Instead of spending tons of money on gifts during this Easter season, use the following gift guide to find the perfect gift for under $20. Will you let this gift guide help you find the perfect gift for the right price? For the coffee lover in your life, choose to give the gift of a personalized coffee mug. This inexpensive touch will give them a simple reminder of how much you care each and every time they drink their morning coffee from the cup. For under $20, this sentimental gift is sure to pull the heart strings of the special someone in your life. Whether its grandma, grandpa or even your child’s teacher, this is the perfect Easter gift. This coffee mug costs $12.95 and can be bought from Personalizationmall.com. Another great gift to give those you care about it s personalized yard stake. This cute gift includes miniature photos and the names of each family in the house. It makes the perfect gift for large families during the Easter holiday season and is sure to become a garden favorite all year round. This personalized yard stake would definitely make for a very good Easter gift and is well under $20. The Easter bunny will visit many houses this year! The perfect Easter gift is a personalized plate to leave the Easter bunny a special treat. Whether the child chooses to leave carrots or carrot cake, the Easter bunny is sure to love whatever special treat is left on this cute plate. To make the occasion truly special, have the child help you create a special treat for the Easter bunny and place it on the plate. Make this a memory and pass down the Easter plate when your child becomes older so that it can become a tradition in his household, too. 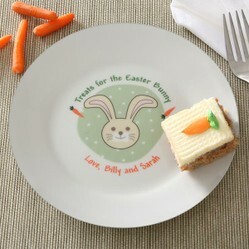 Buy this personalized Easter bunny carrot plate from here. For the jewelry collector that will receive a gift from you during the Easter holiday season, choose a small storage box in the shape of a cross. Complete with the recipient’s name inscribed on top, this will be a sentimental gift that she will remember for a lifetime. Encourage her to store a necklace or earrings that you gave her in the past or buy a new one to add to her collection. This cross box will be a keepsake that she will continue to use throughout the years. You can buy this keepsake box for $18.95 from Personalizationmall.com. Another cute gift for under $20 is a personalized yo-yo. Whether your child chooses to keep in a safe place or practice his yo-yoing skills, this gift is sure to please. This unique gift is sure to be among his favorite of the season. Buy this personalized Yo-Yo from here. With the Easter season right around the corner, it’s time to start thinking about what gifts you will be giving. Instead of spending tons of money, use the gift guide above to find the perfect Easter gifts for under 20. What will you choose to give this year?